I read every single novel written by Picoult to the point that I start to know the ending after reading only two chapters !I don’t mean that this novel is mediocre. No, not at all, the language, the idea and the message of the novel are amazing, but somehow the plot is predictable. The novel is about a young girl, Sage, who in a support group met an old man, Joseph, and the two become friends. Sage does not have many friends because she is self-conscious about the scars in her face caused by a car accident in which her her mother was killed too. As the story unfolds, Joseph confesses that he is an ex-Nazi and he wants Sage, who is Jew, to help him kill himself ! Sage is a granddaughter of Minka, a survivor of the Holocaust. Sage refuses his request, and instead informs the FBI about him. With the help of an FBI agent, Leo, Sage asks Joseph to tell his story to make sure he is really a Nazi and he starts to tell her his story in details, and he tells her that he works in Auschwitz, exactly where her grandmother was prisoned. Sage then encourages her grandmother to tell her about her experience there in order to find out if she could identify Joseph. Minka did know Joseph, and his brother, Frank, too. She tells about how Joseph mistreats her and how his brother was kind and encourages Minka to complete writing her story. At the end Minka died peacefully in her sleep, and Sage who falls in love with Leo, kills Joseph telling him she will never forgive him. It turns out that Joseph is not what he feigned to be, but he is actually Frank ! He was a good person inside and knew that Sage is Minka’s granddaughter and all the time, he wanted her to tell him so he could meet Minka and asks her forgiveness and asks her about the ending of her story ! The chapters narrated by Minka and Joseph are the best. I couldn’t put the book down when I read their chapters. Vivid images and powerful language. The description is so real, disturbing and even unsettling ! Earlier this year I read 3 books about Jew, and this novel adds to my knowledge about them. Picoult did really wonderful in presenting the fact in her novels; I read the facts and enjoyed the description without feeling bored..at all ! 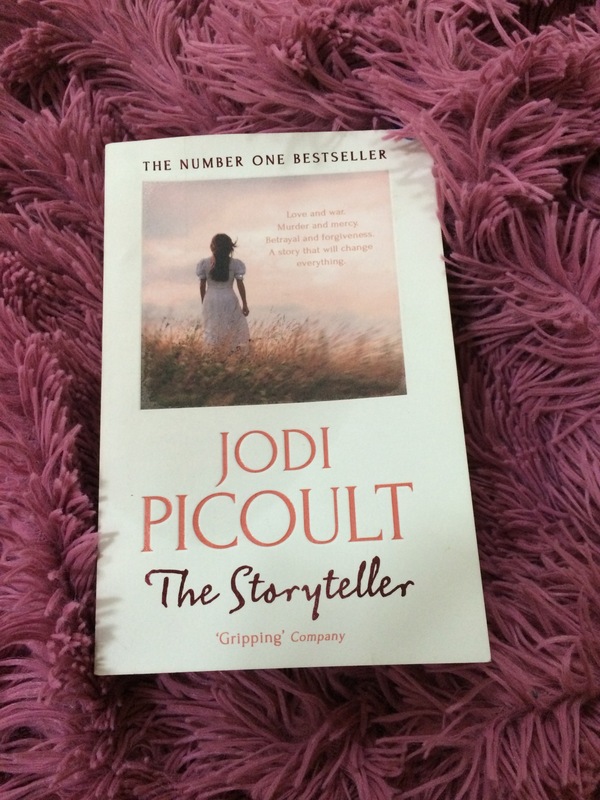 Jodi Picoult comes herself from a Jewish family and she has relatives who survived the Holocaust. However, she says she writes as an outsider, maybe that’s why she depicts Sage as a non-typical Jewish young girl. The use of story within story technique, though old, but I still find it interesting and I love it ! I love the story Minka wrote and how her first boyfriend read into it as an allegory ! After finishing the novel, the reader is left grappling with the questions the author poses about forgiveness and moral choices. The questions are so important and their answer are not easy ! I really loved the way Picoult poses her questions through the novel and intrigues me to think more and more about them. I finished the novels in three days and each time I slept during those three days, I had a dream about the novel ! There is so much about this novel that makes me just love it and want to read it again ! The subject of the novel is related to our world as it was almost 100 years ago. The Jews who suffered the cruelty of the Nazi are repeating the same cruelty in Palestine ! Killing, murdering, destroying Palestinian. Unfortunately, the history is repeating itself. I don’t want to talk much about this very sad issue, but I just want to point out that I can’t believe that humans can be that cruel! Terrorism has no religion or race. The only thing that I didn’t like about this novel is that it was clear from the beginning that Joseph is not what he pretends to be, and that he is Frank. As young boy, Frank loves studying and literature. And in America he works as a teacher. This among many things was an indication that Joseph is Frank. ( He is good natured, likable man…etc). Bottom line: The novel is amazing, though Picoult’s fan would find it less entertaining than her other novels. Still, I would recommend it for everyone.